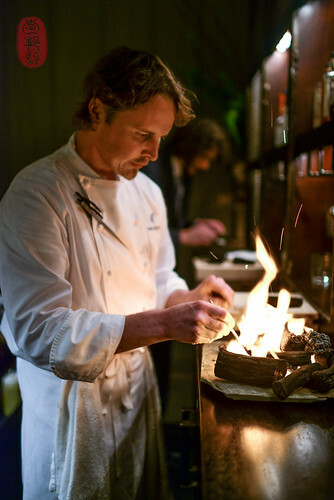 Of this year’s twelve dinners, I was most anxious about the eighth one: the night that Grant Achatz cooked. 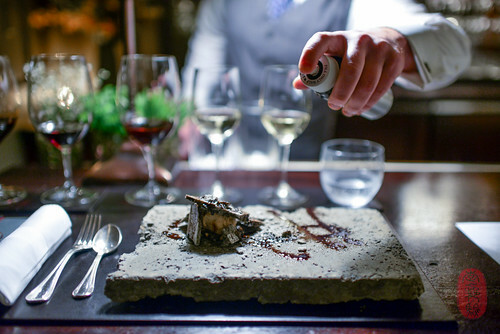 Early in alinea’s life, I was one of the very few, if not alone, in my criticism of that restaurant – or, more accurately, that style of dining. Now, eight years and four meals at alinea later, the restaurant has evolved, and my perspective has shifted. I would venture to say that Achatz’s opinion of me (or, rather, his opinion of my opinion) has also changed. I never questioned Achatz’s talent or inventiveness, of which I remain in awe. Neither did I dare overlook his sense of adventure, or underestimate his partner Nick Kokonas’s keen sense of business – these are the traits that I have admired most in the two. Thankful to have had a rather open (and, I think, rather honest) dialogue about my experiences at alinea with both of them over recent years, I’ve since narrowed the gaps, and, at the very least, have come to more fully appreciate the empire and world that they have created. Personal dining preferences aside, what they have built is very impressive. To keep the alinea world spinning on its axis, with its three Michelin stars in orbit, is no small feat. But to set it spinning on another platform is a totally different story. That is what the alinea team set out to do when it decided to transplant alinea to The Restaurant at Meadowood for one night. 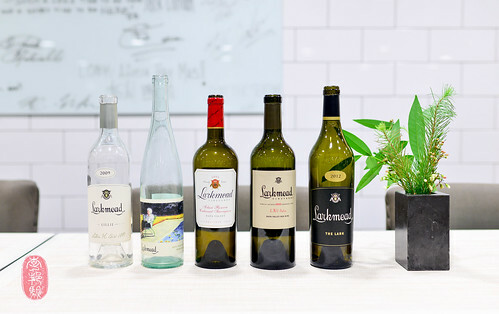 As I watched Achatz’s 1,500-pound shipment of boxes being unloaded onto the dock at Meadowood Napa Valley the day before the dinner, I wondered how, or if this was going to work. Achatz brought with him Mike Bagale, the current chef de cuisine at Alinea; Eric Rivera, alinea’s Director of Culinary Research; and Tim Coppola, who is on the service staff at alinea, and who helped train the front of the house staff when Eleven Madison Park and alinea switched places for a week in 2012. 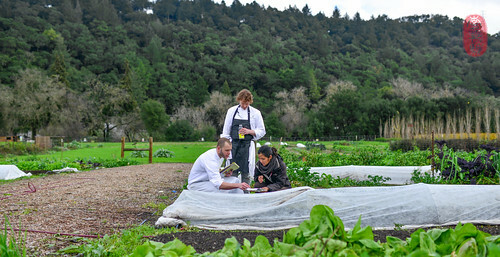 Together, they worked with The Restaurant at Meadowood to assemble a truly incredible show. Some of what they presented on the eighth night were well-known alinea dishes, or variations of them. Both the “Hot Potato, Cold Potato,” as well as the “Black Truffle Explosion” were served as passed appetizers during the hour-long reception in the kitchen before dinner. 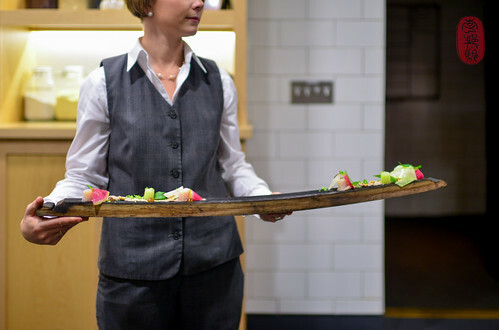 I also recognized the “skate necklace” with brown butter and lemon from my first meal at alinea in 2006, trimmed down into a one-bite canapé. The pheasant tempura skewered on a maple branch (which I had in 2010) was reincarnated here as a nugget of eggplant and banana, battered and fried, and skewered on a cinnamon stick. It was spiced with something musky, something curry-like. It was delicious. And, at the end of the meal, those famous “balloons” filled the dining room with high-pitched giggles as diners sucked in the helium with delight before eating the deflated bubble made out of green apple taffy (you’ll want to see the video of Bagale and Achatz making the balloons). Many of Achatz’s courses at this dinner were inspired by alinea dishes, past and present, with which I was unfamiliar. There was an alabaster square of gurnard — sea robin – served on the gentle slopes of oak barrel staves. He had used this plating at alinea before, and it seemed an appropriate presentation in Napa Valley (the staves are torched and washed after each service). There was a two-part campfire course, recently on the menu at alinea, that I had never seen before. It lit up the tables at The Restaurant at Meadowood that night. Arranged around a flaming stack of binchotan were cubes of hamachi on pine skewers. Diners were given the option to either cook the hamachi over the flames, or to eat it raw. After the flames died down, the cooks came out of the kitchen to remove some of the large binchotan logs, which were actually charred parsnips made to look (very convincingly) of charcoal, from the ashes (the ashes had been doused in Everclear and set alight). Beneath the campfire was revealed a packet of pork belly wrapped in thick kombu. The pork and parsnips were carved and plated table-side. To properly set the stage for a “graffiti” dessert based on urban tag art, Achatz and his team spent some time mixing concrete behind the restaurant the day before their dinner, molding special concrete “plates.” On the plates, they presented hazelnut ice cream, an intense shot of Perigord truffles, and some crispy meringue-like crumbles made to look like chipped concrete. Servers came to the tables with pressurized cans filled with balsamic vinegar (a bolt had been dropped into each can before they were sealed and pumped, so that when the servers shook them, they sounded like actual aerosol spray paint canisters), and “tagged” the desserts. When I last ate at alinea (last year), we were served a skyscraper city of seafood, including a sweet shrimp that was served nearly raw. At line-up at The Restaurant at Meadowood, Achatz told the staff about this shrimp, which he also served raw at this dinner, draped over fried lentils and an assortment of beans that looked like pebbles (hence the name of this course on the menu, “pebbles”). The texture of the fried lentils – still tender, yet also crispy – against the silky shrimp was terrific. The flavors were great too. This was my favorite Achatz course of the night. I didn’t catch the story about Achatz’s matsutake course, which was remarkably similar to Kostow’s samp and matsutake course from the seventh night (Kostow’s course was a porridge of samp grits and squid paved with thinly sliced matstutake mushrooms and garnished with young pine needles). Achatz’s dish was a “porridge” made from tapioca pearls, with bits of abalone throughout. Tented around the porridge were thinly shaved slices of matsutake, scented with pine. Whether the similarity was by design or coincidence, I know not. The Restaurant at Meadowood revived its salt-baked rutabaga on this night, which I had seen in years past. It was sliced thinly, and sauced with maple syrup and goat butter, and garnished with white truffles. Every year, I marvel at how much the flavor of rutabagas overlap with the aroma of white truffles. And for dessert, Kostow’s kitchen painted the tropics with a more saturated palette of flavors: dates and caraway, brightened with young coconut and lime. Logistically, this dinner was extremely complicated. 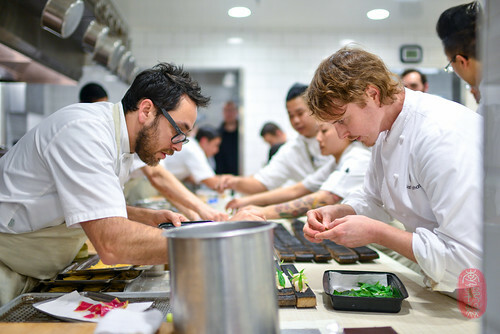 And it is a testament to the professionalism and talent of both Achatz and his cooks, who arrived extremely organized – with pre-printed labels, prep-lists, and even station markers for the cooks at The Restaurant at Meadowood – as well as the team at The Restaurant at Meadowood, that the dinner went off without a hitch. As someone who had a rare glimpse at both the behind-the-scenes prep, as well as the game-day play-by-play in both the kitchen and dining room, I was amazed by the quality and consistency of the food that left the kitchen, and the ease and grace with which the night passed. Nathaniel Dorn, the Restaurant Director at The Restaurant at Meadowood, and his front of the house staff, are especially to be congratulated for their work that night. The servers, who didn’t receive the final menus until 16:00 at staff line-up, had all of the dishes, service technicalities, dietary restrictions, and the guest list memorized by the time the first diner showed at 18:00. Although these same demands are required of the staff every night of the Twelve Days of Christmas, the moving parts on this eighth night of service were especially complex. This dinner required every staff member, from the front door to the dish pit, to fire on all cylinders. And they did so effortlessly. If for nothing else, this dinner stood out among this year’s twelve as proof that The Restaurant at Meadowood is capable of that which very few other restaurants in America are. Consistency at this level, with this many last-minute curveballs is rare. This night gave some meaningful credit to six Michelin stars and The Restaurant at Meadowood’s shiny, new James Beard Award for Outstanding Service. It was a delight to see and experience it. Below, you’ll find the menu from the eighth night of the Twelve Days of Christmas featuring Grant Achatz of Alinea, and wines by Larkmead. Following the menu, you’ll find a slideshow of all of the photos that I took. Traditional garnishes, brioche foam, yolk. Ebi, ogo, clam shells, beans, fried lentils. served on a oak barrel stave. Maple, nasturtium, goat butter, white truffle. ~ by ulterior epicure on December 27, 2014.